Shelter Reform Advocate Uncovers Proof that the Number of “Treatable” Animals Reported Killed was Altered. Animal Care Centers of New York City (ACC), the City’s pound, is no stranger to scandal. The Department has been plagued by one scandal after another — including a long, ignoble history of neglect, abuse, and killing — since its inception, including its most recent ones which include ramming through a 34-year contract to maintain the status quo until 2052 at a cost over $1 billion in taxpayer dollars, and another which animal lovers dub “Spay Neuter Kill,” is tantamount to vivisection, and led to an inquiry by the state Attorney General. Indeed, the founding of ACC was itself a scandal. It was established as a “non-profit” to give the false appearance of independence, even though it was created by the Giuliani administration, has a singular mission of running animal control for the City, operates under city-owned and controlled facilities, has a governing structure dominated by the City, and is controlled by the Mayor and Health Commissioner. That allows the City to water down accountability and ignore problems while giving the Mayor and Health Commissioner someone else to point the finger of blame at. More recently, ACC claims to have achieved a 90% placement rate, but that, too, comes with controversy. While there is little doubt that more lives are being saved now than a decade ago, ACC continues to kill healthy animals (although it falsely claims it doesn’t), allows them to languish, in pain, without veterinary care, and kills them after neutering. In addition, the increased lifesaving is being done largely by rescuers, not through adoption (whose numbers remain paltry). Moreover, dog placement rates have declined two years in a row and the overall number of animals killed actually increased in 2018 (3,194 compared to 3,143 from one year prior). Finally, ACC’s reported “save rate” excludes whole categories of animals in order to claim better outcomes than it actually achieved. As such, it has not achieved a 90% placement rate. But that is not all. New evidence has emerged that those statistics may have been deliberately changed after the fact. In 2017, ACC reported that it killed 431 animals who were “Treatable – Manageable” and 33 who were “Treatable – Rehabilitatable.” In 2018 (January through the end of November), they originally reported to have killed 331 animals who were “Treatable – Manageable” and 77 animals who were “Treatable – Rehabilitatable,” what one advocate describes as “an unsightly increase over the previous year’s total in the latter category.” In other words, the number of animals ACC reported to have killed who were deemed “rehabilitatable” more than doubled. That is, until the numbers were changed at the end of the year. Despite monthly reports which showed otherwise, at the end of the year, the number of “Treatable – Manageable” animals killed was mysteriously reduced from 331 to 282 and the number of “Treatable – Rehabilitatable” animals killed was changed from 77 to 29, making it appear that fewer “rehabilitatable” animals were killed than the year before, even though they originally reported that they had more than doubled. Advocates worry that the fact that they killed more animals overall gave them an incentive to make it appear that fewer treatable animals were killed, by changing outcomes after the fact. The animals killed were simply moved into the “Unhealthy & Untreatable” column to avoid criticism. While ACC removed the original reports from their website, it did not erase them entirely. Craig Seeman, a New York advocate working for reform who uncovered the changes, says he was still able to access some of the original reports from the server by typing in the old links, even though they were no longer posted on ACC’s website. In other cases, he was able to access the original reports by looking at them in archived copies of the website available online. Those comparisons between the current reported statistics on its website and the originally posted statistics prove the numbers were later changed. 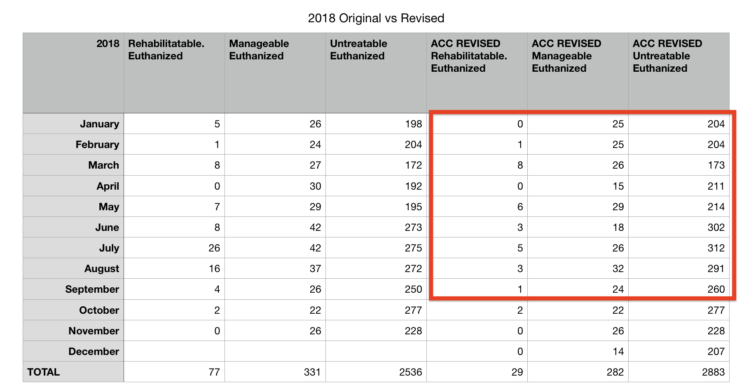 When the July 2018 statistics were originally posted, ACC claimed to have killed 26 “rehabilitatable” dogs and cats that month. At the end of the year, the number of dogs and cats killed deemed “rehabilitatable” more than doubled from the previous year. Tragically, ACC is not the only agency that manipulates statistics in an apparent bid to report “progress.” Former pound directors in Broward County, FL, and Hillsborough County, FL, were also found to have altered computer records. Like New York City, they shifted animals who were killed into different categories. The director in Broward lost his job over it. It should go without saying that No Kill isn’t achieved by recategorizing animals as “untreatable.” It is achieved by actually saving their lives. And that is done by replacing killing with humane alternatives that have already resulted in success in other cities throughout the nation.